As my last issue as your Editor-In-Chief, I must say it has been my greatest pleasure to serve the campus community. The Pioneer has taught me a great deal about journalism, my future career and life itself. Who knew all those long nights putting together the newspaper would be some of the best memories of my college career. I cannot thank my staff and editorial board enough for helping me create a newspaper that not only informs but stays true to reporting accurate news. Thank you to my advisor, Professor Levin for recognizing my passion, hard work and blessing me with the opportunity to take on this role. I also want to thank our readers, because without you, there would be no Pioneer. 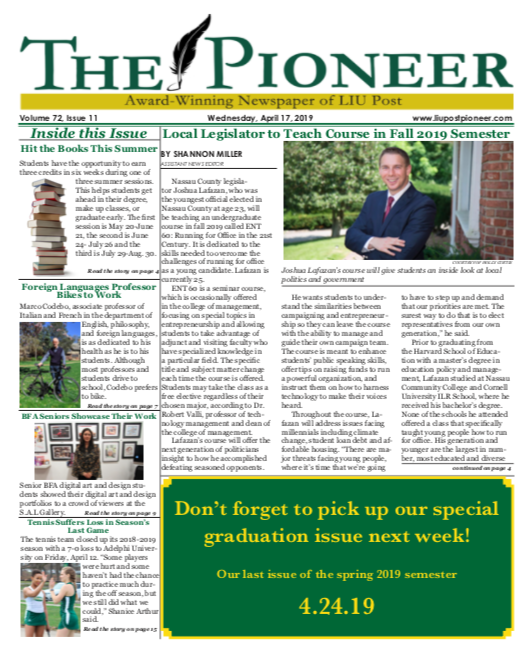 I wish the new editors luck in continuing to make the Pioneer the best that it can be.